Your retirement income planning needs to first look at what you will need, before looking at how to have a passive retirement income. Having been in the financial services industry for 15 years, every day I helped people with their retirement income planning. For many it was a shock to find out how much they would need to save to end up with enough money invested that would give them a passive retirement income. Again, I have mentioned this in other areas of this website and it is worth repeating again. Saving money on a weekly basis is only ONE way to go and it is actually VERY effective if you have enough time for the compounding effect to kick in. That’s why governments are encouraging people, with tax savings, to put their money into what we call, here in Australia, superannuation. There is a very good reason for that; Baby Boomers. Before you scare yourself totally, with your retirement income planning, take stock of what you DO have. Do you have a retirement fund? Any idea as to what that will be worth when you do actually retire? Many retirees use part-time employment to provide about one-fifth of their annual retirement income as show in this article from Yahoo Sources of Retiremnt Income. You may well need to be a little creative about the combination …that is where a good financial planner can help. Just remember when talking to them that ultimately it is YOUR decision and go on your intuition (not fear) when making financial decisions. Your retirement income planning process can be fun and simple. It really isn’t rocket science, just takes a little effort. 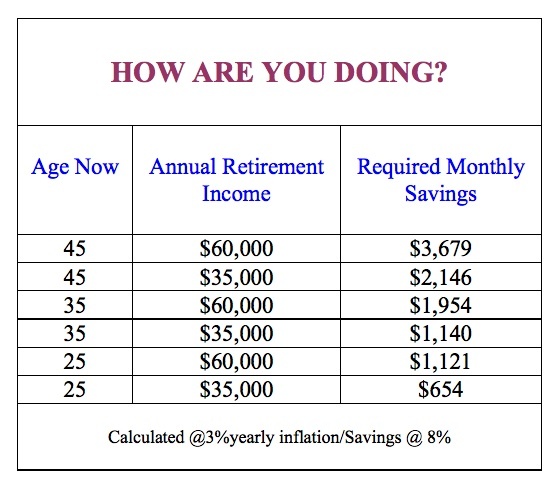 use a part-time residual income program to suppliment their retirement. I suspect, more importantly it gives them a sense of satisfaction, feeling of usefulness and the ability to continue to contribute to others. For anyone who loves to be with people and contribute to others, I have found this to be fabulous for retires. Not only that you can build it into a residual or passive income as well. Check out my favorite residual income. Learn how to create an income without a job, by helping people so you can stay home and follow your heart.